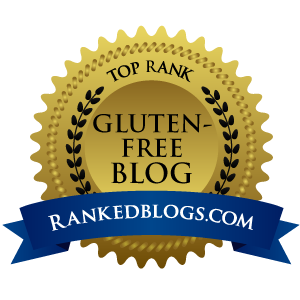 … “Cream Cheese” is Back in My Gluten-free, Dairy-free Diet! In the dairy-free world there are a few items that I’ve truly missed … not realizing that many of these could easily (and more healthfully and inexpensively) be made right in my own kitchen. Yes, I know, I can be a slow learner at times. But as soon as I make these profound discoveries, I become ecstatic to share them with you. Why should it take you forever to reap the benefits of these discoveries just because I’m a slowpoke? Today I’m so excited that “cream cheese” is back in my kitchen and on my crackers, sweet breads, schmeared on my flat breads, well, you get the idea. It’s a good great thing! And with this homemade version I feel confident that there are no hidden ingredients. 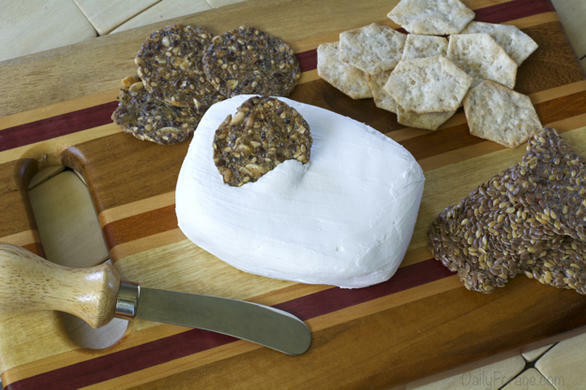 This is a dairy-free, gluten-free, vegan cream cheese recipe. The process is so, so simple. The only difficult aspect of this recipe is the wait time. Yes, sorry, this is not an instant gratification recipe … it’s a process, albeit simple. One good thing, though, is that if you keep a can of coconut milk in your fridge at all times, you’ve just reduced part of “the process”. How simple is that, right? With a can of well-chilled coconut milk (I prefer Thai Kitchen because it performs well every time and it only contains coconut and guar gum), you’ll be able to scoop out the solid milk or “cream”, and reserve the liquid coconut water for another use, such as smoothies or shakes. 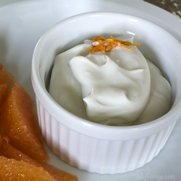 The solid cream needs to become cultured to provide that tang found in traditional cream cheese. By adding a little probiotic powder or some lemon juice and a pinch of salt, these will create a similar sharpness. Now for the straining of the excess liquid. Place a fine-mesh strainer over a bowl. I like to nestle my strainer in a large-mouthed funnel, then rest it in my bowl. It stabilizes the strainer. Place a coffee filter, cheese cloth, or a nut bag in your strainer. I like to place a coffee filter at the bottom of the strainer, then place my nut bag in the coffee filter. I prefer the double duty approach, but it certainly isn’t necessary. I also like to lightly place a coffee filter over the mixture as a light covering. Remember the hard part I mentioned … waiting? That’s what happens now. 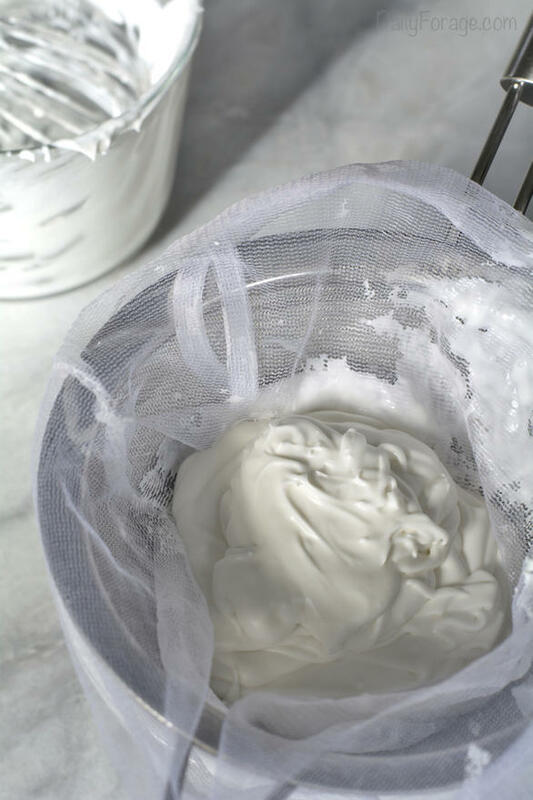 Remove the solidified “cream cheese” from the strainer, leaving all the liquids behind. Place this in a bowl with a lid. If you wish to add in any extra herbs, dried fruits, etc. this it the time to do so. Chill in the refrigerator for at least six hours. Your tangy, well-cultured spread is ready to serve. Happy Homemade Dairy-free Cream Cheese indulging! 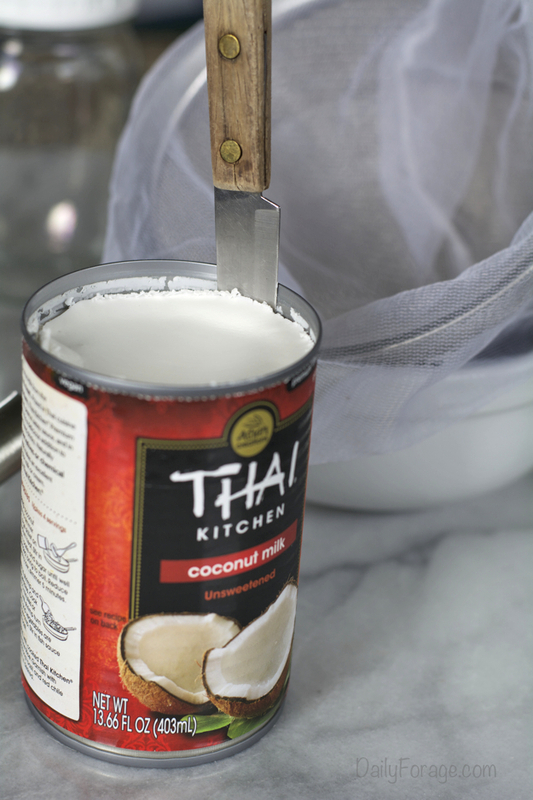 Carefully remove the chilled can of coconut milk from the refrigerator, using care not to tip or shake the can. You want to keep the solid milk separate from the coconut water. Open the can and, using a knife, trim around the edges of the can to loosen the solid milk. Slide the milk out without tipping the can. Place the solid milk into a bowl. Reserve the coconut water for smoothies or shakes, if desired. Add the probiotic powder OR the lemon juice and salt to the coconut milk. Stir well to combine. Place coconut milk mixture into a nut bag nestled inside a coffee-filter-lined strainer over a bowl. Cover with a coffee filter, if desired. Place in a cool, dark place, such as the microwave or oven. Let sit for 24-36 hours to drip off the excess liquid and become cultured. Taste after 24 hours to check the tang level. The longer it sits, the more the tang will develop. Don't go past 36 hours. Transfer the creamy, semi-firm mixture to a container with a lid. If you wish to flavor your cream cheese, this is when you stir in your "add-ins". Cover bowl and store in fridge for at least 6 hours to allow cream cheese to solidify and chill. Ready to serve when firm. NOTE: Homemade Dairy-free Cream Cheese does not provide good results in baked recipes. If you decide to try it, please do so at your own recipe peril. It's risky business! Happy Homemade Dairy-free Cream Cheese indulging! Have you been missing cream cheese as much as I have? How is your favorite way to enjoy it? Can i make it with homemade coconut milk? I haven’t tried making this recipe with homemade coconut milk, but I certainly think it would be delicious and successful. Thanks for asking and be sure to let me know how it turns out! Hi there! Thanks for the recipe! It looks great! Do you know if the fridge counts as a cool dark place, or is it too cold? We don’t have AC and I’m not sure any area in our apartment will stay cool long enough. Wouldn’t want to make us sick :p thanks again! Hi Frannie. Thanks so much for the great question. It’s so important to keep food safety in mind. I have always kept my cream cheese in our microwave (door closed, light off, no heat) during the processing time. I’ve never had a problem with it turning bad or making us sick. Another blogger puts hers in her oven (door closed, no heat) during processing, also without incident. Once the processing time is finished, just be sure to put the cream cheese in the fridge and keep it there. I hope this answer helps. Let me know how it turns out! Can this be used to make cream cheese mints? Great question! I’ve never tried it but I have used this cream cheese in many different types of recipes, so I would think it’s worth a try. Best of luck. Let me know how it turns out! Hi! Can I make cheese cake with this? Hi Lina! That’s an excellent question. I have not tried heating this non-dairy cream cheese, so I’d “think” so, but I wouldn’t try it for a special occasion. For a raw cheese cake, this would work beautifully. Good luck. Thanks for asking, and be sure to let me know if you attempt it. Cheers! How long will this coconut cream cheese last in the refrigerator? Thanks for visiting and for your question, Tana. Coconut Milk Cream Cheese has lasted at least 7 days in the fridge, and may last longer, but often we eat it before that time frame. Hope it fills a void for you, as it did for me. Cheers! could i use coconut cream (from a can) instead of the milk process? I don’t believe that coconut cream from a can will separate like the canned coconut milk does. I believe it has stabilizers in it to maintain its creamy, homogenous texture. Since we only want the harder, solid portion, for this reason I don’t believe the cream will work. If you try it, please let me know how it turns out. I love learning new options. Thanks for stopping by and asking the great question. Thanks for the recipe. It looks great. Can I make it with home made coconut milk. Great question! I’ve never tried making this with homemade coconut milk. If you try it, be sure to let me know how it turns out! This is my first time working with coconut milk and cream. When I took out my solid part, there was a creamy portion but also this hard layer on top that I’m having trouble mixing in. Do you usually use the hard part? If so, how are you mixing it with the rest? Hi Katie! Thanks for the great question. Yes, the solid portion is the part to use in this recipe. Save the creamy/watery liquid for shakes or smoothies. The solid coconut cream will soften when you work it with a fork. I do this for a few minutes until it is soft enough to continue stirring with a whisk, to blend in the probiotics or lemon juice. When the coconut cream is resting and draining through the cheese cloth, there won’t be much liquid that extracts, but just enough to leave the cream cheese with the perfect consistency. I hope this helps. Also, different brands of canned coconut milk may have different consistencies to begin with. I have found Thai Kitchen coconut milk to always have just the right texture for my cream cheese. Cheers to dairy-free living! My cream cheese turned yellow..like bright yellow. I’m thinking it’s gone bad? I kept it in my cupboard which stays pretty cool (for 36 hours) and used 3 capsules full of probiotic. Hi Connie, This looks amazing, and I can’t wait to try it. I’d like to know which brand of probiotics you use in this recipe, so I can compare the strains in my capsules. I have a trick with the coconut cream, and that is to refrigerate the tin upside down, then turning the tin correct side up when opening it. The coconut water will be on the top and easy to pour out. Hi Linda! Thanks for stopping by. 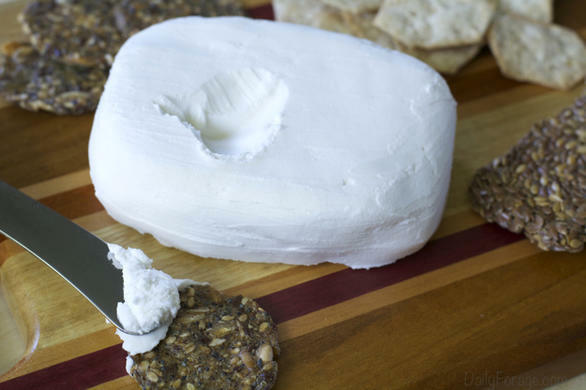 I think you’re going to love this coconut milk cream cheese. 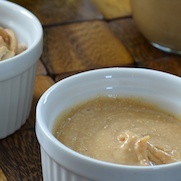 I think any brand of probiotics that work for you will work for this recipe. I specifically used MegaFlora Probiotics with 20 Billion CFU. 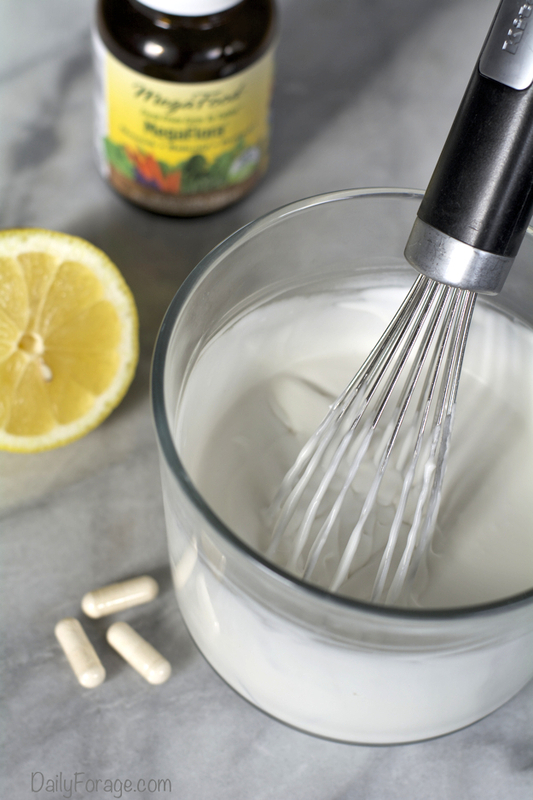 If you use a stronger probiotic, you may need only one or two capsules of powder. Certainly play around with it to see how you prefer the taste and strength of tang. Will this cream cheese work well when making cream cheese frosting? Hello Connie, I’ve been experimenting with different coconut cheeses and I’d like to try your recipe. Would I be able to add nutritional yeast to this recipe to give it a cheesier flavour? As well as using apple cider vinegar instead of lemon juice to give it a different flavour? Hi Connie! If I use lemon juice, does the cheese still need to “culture” for 24-36 hours? Or is it even culturing if there are no probiotics in it? Can I use a Doterra probiotuc capsule in this recipe? About how many ounces does this recipe make?